From Carlton to Collingwood, and back again. Ken Aitken was a determined, honest footballer who made the most of his ability in 31 VFL games at Carlton and Collingwood between 1948 and 1952. A one-pace follower or ruck-rover who rested in defence, he captained Carlton seconds to the 1951 VFL Reserves Premiership, and 12 months later, was 20th man in Collingwood’s 1952 Grand Final team. In later years he returned to Princes Park, and coached the Under-19s into the finals in 1957-’58. Born Kenneth David George Aitken in June, 1925, Ken played junior football at East Coburg, South Merlynston and Coburg High School before joining Carlton’s under-19 squad. After a thorough grounding through the lower grades, he was rewarded for a consistent season with the seconds in 1948 by selection for his first senior match in Carlton’s last home and away game of the year, against Richmond at Princes Park. The Blues won a tight match by five points, and Aitken survived a torrid initiation against the Richmond big men, including the fearsome “Captain Blood;” Jack Dyer. In 1949, Carlton improved dramatically and won through to a second Grand Final in three years, only to be slaughtered by Essendon. Aitken played nine of the first thirteen games before being injured, and wasn’t able to reclaim a place in the seniors until the following year. In 1951, Ken was appointed captain of Carlton Reserves. Although only 183 cm, he revelled in the physical clashes, taking on the role of his team’s first ruckman and leading by example. In an almost perfect season, Aitken led his side to an emphatic win over Essendon at the MCG on Grand Final day, and was generally recognised as best on ground. A week or so afterwards, he was proclaimed Reserves Best and Fairest. By then, he was still only 23, and more senior football for the Blues seemed highly likely - at least until early 1952, when senior coach Percy Bentley called him aside with the news that his services were no longer required. Although stunned at first, Aitken soon pulled himself together and approached Collingwood, asking the Blues’ hated enemy for an opportunity to train. The Magpies, like Carlton, had a well-stocked following division. However, Aitken’s tenacity at the contest quickly paved his way into their senior side, and he was selected for 17 senior games over the season. In an exceptional year for the club, they fought their way through to the Grand Final against Geelong, the defending premiers. Victory would have been a fairytale outcome for both Aitken and the ‘Pies, but it was not to be. In front of nearly 83,000 at the MCG, the Cats hammered their challengers by 46 points, and Ken sat on the bench as 20th man throughout the entire game. In April of the following year, Collingwood were finalising preparations for the new season when Ken was quietly informed – for the second time in 12 months – that his prospects of senior selection were very slim. Taking the hint, he requested a clearance to neighbouring VFA club Coburg, and gave the Lions committed service over the next two seasons. The Blues youngsters made the finals in 1958 and ‘59 under Aitken’s leadership, and for the rest of his life he was a passionate supporter of the club and its Past Players Association. He and Blues great Jim Francis remained particularly close until Jim’s passing in 2004. 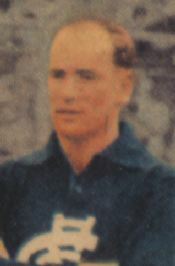 Aitken wore three different guernsey numbers at Carlton; number 5 in 1948-49, number 17 in 1950, and number 29 in 1951. In his one season at Collingwood he wore 28. On June 12, 1948, during his first season with Carlton, Aitken represented the VFL Reserves in a game against the Werribee Association. Blues team-mate Fred Lalor was also a member of that team. Ken passed away on June 3, 2008; a few weeks short of his 80th birthday. Contributors to this page: PatsFitztrick , Bombasheldon , tmd1 , molsey , p(12)terg , WillowBlue , timmyd , dgreen2 , keogh , true_blue24 , Juzz and admin . Page last modified on Monday 29 of April, 2013 21:11:53 AEST by PatsFitztrick.